“There’s something very wrong with that lad” I think to myself, as a bead of sweat detaches itself from the rim of my cap and drips, irritatingly, onto the lens of my dust-coated glasses. The drip rolls slowly across my field of view, smearing a path across the dirt as my tyres scuffle and scrabble at the dust beneath them, tracing a similar looking line behind me. We’re 90-something miles into this year’s Dirty Reiver and Phil’s just professed his undying love for the climb that’s recently come into view. I’m lost as to what could have caused this outburst, as far as I can tell it has no redeeming qualities at all. It’s the wrong sort of steepness, it’s too long, the surface is too loose to stand up on without wheelspinning, the embedded stones are slightly too large for my tyres to roll over smoothly, so I’m having to move around a lot to keep traction, the dust holding them in place is too dusty and is coating everything – not that the previous 90 miles haven’t been exactly the same, but this hill seems like a more concentrated version of al the irritating bits so far. It’s not even got a big-country view at the top, it just goes into some more woods that smell too much like fresh pine for my liking. Stupid bloody climb. I slowly start to realise that there’s nothing wrong with the hill and I’m just being a grumpy sod. As we crest the summit and find ourselves hurtling down another fast, loose, swoopy, fireroad descent I sit up to soak in as much of the breeze as I can. We’re at the pointy end of a 21 degree temperature swing – the start line hovering at around the freezing point and the top of this climb (hereafer known as Grumpy Hill) bathed in 21 degree bright sunshine. I’ve gone from achingly cold fingers and toes while trying to warm up, with arm and knee warmers, base layers and gilets, caps and double gloves doing little to fend off the chill to staring longingly at lonely patches of snow on the hilltops, wishing I could roll around on them, turning them instantly to steam. The gilet is now stuffed (badly) in my little camelbak, which is protesting how overpacked it is by repeatedly smacking me in the back of the head over every bump (of which there are a lot in a 120 mile gravel race). The arm warmers are rolled and bunched around my wrists, creating the worlds worst tan lines ever. There was a point, about 10 miles in to the event, where I was perfectly dressed for the temperature. Before and after that it’s been all wrong, but we’ve not had time for me to sort out my wardrobe mid ride, we’ve been flying round the route. Flying. Over an hour up on last year’s (already fast…) time and showing no signs of slowing down, even if one of us is in love with the hill we’ve just smashed it up. Photo taken just before I started to wilt in the heat! The event has been brilliant up to this point. It always is, but this year it’s been brilliant and fast all at the same time. We arrived at the first checkpoint, 30 odd miles in, in a group of about 15 people, with an average speed of nearly 18mph. The halfway point came and went with little drop in speed. By the 130km/200km course split the group had broken up with myself and Phil a couple of minutes back on 2 other riders, but we’ve still left the final checkpoint with an average speed of 17mph. The miles have flown by under bright blue skies and utterly perfect conditions for Big Rides. Winter’s been awful, but rides like this make all the rainy, cold, dark training worthwhile. Maybe Phil had a point about that last hill, it was lovely, in it’s own way. As the 100 mile mark ticks over, we’re joined by another rider who’s worked his way back up to us – strong stuff. The three of us fly round the trail around Kielder Water. It’s like the icing on the cake as it swoops and curves with the shoreline on a smooth, grippy track. As we cross the dam wall and race back towards Kielder Castle I can’t help but grin as I stare across the water, it’s beautiful. Every hill in the background has been ridden over, there’s nothing else to do now but cross the finish line and drink beer. Saturday day saw a nice ride along the coastal cycle path to the pier at Mumbles. A chilled out pace in glorious spring sunshine, sharing the route with hundreds of other families was ace. Everyone happy, everyone having a little adventure at the seaside, away from the hustle and bustle of the busy main roads. Brilliant. Saturday evening saw me eating pizza and drinking beer, with a nice lung-burning time trial down the beach in the fresh evening gloom. Every year I’ve entered Battle on the Beach I’ve paid the extra to do the night lap and, up until this year, every year the lure of the bar has been too strong. Not this time though, this time I was well up for it. Not up for it enough to do any sort of warm up, or anything as sensible as that, but up for it enough to line up with 200 other grinning riders, each being set off from the start line at 10 second intervals into the darkness. I’d overheard the commentator mention something about riding through the main marquee, right past the band and though it was just a joke, but seconds after launching myself off the startline I found myself briefly sandwiched between a crowd of dancing onlookers and an enthusiastically strummed version of The Stones’ “Crossfire Hurricane” (I think, I was only in there for about a second!). Brilliant. The beach exit had turned into a bit of a queue up a steep, soft sand bank, but it didn’t seem to matter. Everyone was loving it and everyone waited patiently. The return leg along some old, sandy, tank tracks and some lovely swoopy singletrack saw me miss a couple of corners but refuse to slow down to correct anything – favouring just crashing through course-side bushes at full pelt to get back on track. Probably not the fastest way round the route, but awesome fun, if a little spiky in places! I finished 18th and went back to the bar. Sunday morning brought with it some very uncharacteristic rain. I decided to ‘up’ the amount of clothing I would wear for the main race and added a softshell baselayer and arm/knee warmers, thinking that it might get chilly if the rain persisted. somewhat annoyingly (for me) it didn’t amount to much during the race and, within about 30 seconds of the starting hooter going off (from where I immediately went from “at the front, on the front row” to “a thousand people back somehow” on the startline run across the soft sand) I was absolutely boiling! Saturday’s tailwind had grown overnight and groups of riders were hurtling across the sands at well over 35mph. Not only did you need fitness to compete and work your way up through the riders, but a big gear was a necessity – I was spinning out 46×11 and wishing for something bigger! By the time we finished the first lap beach assault I’d worked my way back up into the top 20, which was pretty good (for me). I lost a few places through the singletrack and, weirdly, along the sometimes-sand-sometimes-grippy doubletrack section, where I thought I’d be able to hold my own, but I consoled myself with knowing my heartrate hadn’t dropped below 180bpm since setting off. Any places lost certainly weren’t as a result of a lack of effort! Laps 2 and 3 went in a similar way. Silly fast down the beach in whatever group i found myself riding with. 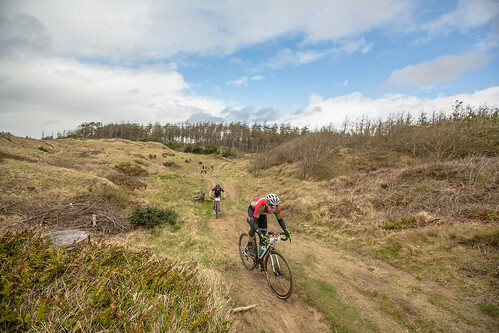 Lose a place / regain a place etc through the doubletrack & singletrack sections. Stay as fast as possible. Put in all the effort I can. Try not to crash. This plan went well until the final lap, where a slip in the singletrack, with only a couple of miles remaining, saw me slide out to the side of the course, both feet unclipped. Suddenly rider after rider hurtled past. I fumbled around trying to get going again, my glasses steaming up as my feet slid around on the pedals trying to get clipped back in. I couldn’t see a thing, riding through complete guesswork until enough airflow across the lenses cleared them enough to give me an idea of what was in front of me. Panicked gasping ensued as I tried to chase back as many of the newly-ahead-of-me racers. I managed to get a couple of places back but crossed the finish line in 33rd – having dropped about 7 places due to that one fumble. It gets properly competitive the further towards the front you are!